Astrobee is "a compact one-foot-cube of a robot in development at NASA's Ames Research Center in Silicon Valley. This robot is designed to work autonomously without astronaut supervision, or to be remotely operated by mission controllers." All in all, from inventory checking to monitoring noise levels and more, the robotic bees are all set to be helpers, and they will serve as the crew's extra eyes and ears. Three Astrobee helpers will be joining the Space Station crew—and two of the bees are scheduled for launch soon. 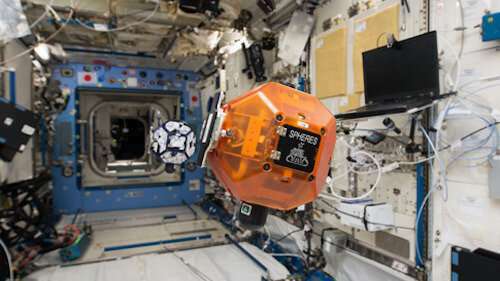 They have been given cameras and sensors for navigating inside the space station and avoiding obstacles. The robots will be empowered by fans as well as their vision-based navigation. NASA has a visual presentation that gives you an idea of how the robotic bees were designed to perform. The fundamental idea is for them to do certain basic tasks so that the astronauts will be freed for spending more time for other tasks. Tracking inventory? Astrobee in cruising the ISS could be using its scanner to verify the location of items rather than astronauts doing this. Monitoring duties? Astrobee can monitor environmental conditions such as air quality or sound levels. The Astrobees were given a robotic arm that can be attached if the call for duty is for cargo handling or running experiments. Speaking of experiments, the Astrobee will be handy for research tasks and in and of itself presents an opportunity for research—the study of human-robot interactions in space. "Learning how robots can best work with humans in close proximity will be key for exploring the Moon and other destinations," said NASA. The robots were developed at the Ames Research Center in California. The researchers provided a mockup of the station's interior. They run on battery. Recharging is done automatically; they can dock at a power station. When an Astrobee's battery runs low, the robot will autonomously navigate and dock to the station to recharge. When and where will the robots join the crew? Reports said two of the three Astrobee robots are scheduled for their space launch to launch this month from a NASA facility in Virginia. Trevor Mogg in Digital Trends traced the origins of these robots. They were several years in development; in addition to those sensors and cameras, "A touchscreen, speaker, and microphone are also part of the package." Mogg also noted the earlier SPHERES, NASA's first-generation robotic assistant, and now Astrobees will take the stage. "The new arrivals will also get to meet CIMON, an artificial intelligence robot developed by Airbus and Germany's DLR space agency, and powered by IBM's Watson supercomputer." Please tell me they named them Huey, Dewey and Louie. Wonderful tech of the future - human/robot interaction with mutual assistance. In the try-outs, are they in free-fall as if they were on the ISS, or hanging from some kind of support in the Clean Room? I hope they are sending a few lightsabers with that.